Public: Approximately 19 members of the public. · Spoke against the recommendations. · Stated that this is only stage one of a three stage proposal. · Raised concern in relation to increased traffic volume and the impact that the development may have on the heritage value of the street. The Presiding Member Mayor Emma Cole thanked Ms Chin for her comments and informed members of the gallery of the application process regarding each stage of the proposal and opportunities for residents to provide their comments. · Stated that the proposed 5 group dwellings do not comply with the applicable R coding requirements. · Requested that the applicable R code rules are applied to the development site and that the developer be required to adhere to the minimum deemed requirements. · Stated that residents have significant concerns regarding increased traffic volume and parking in Janet Street, Sheridan Lane and Hammond Street as a result of these developments. The Presiding Member Mayor Emma Cole thanked Ms Holmes for her comments. · Spoke against the application and against the subsequent proposed 5 group dwellings at 16a Florence Street. · Noted that there is no walkway, cycle lane or path on Sheridan Lane and stated that any increased traffic volume would be a potential safety hazard. The Presiding Member Mayor Emma Cole thanked Ms Macoboy for her comments. · Stated that the gym complies with Noise Regulations. · Stated that both the City’s EHO and the applicant’s own acoustic data expert have assessed the monitoring data and have confirmed that the analysis shows compliance. · Stated that the complaints that were made at the Council Briefing on 30 January 2017 relate to the daytime operation of the gym which is not the subject of the application before Council. The Presiding Member Mayor Emma Cole thanked Ms Moharich for her comments. There being no further speakers, Public Question Time closed at approximately 6.14pm. 3.1 Response to a question from Mr Dudley Maier taken on notice at the Ordinary Council Meeting held on 12 December 2017. That the minutes of the Ordinary Meeting held on 12 December 2017 be confirmed. We are about to embark on our second round of Leedy Streets Open where we close Leederville off to cars and leave it accessible only to people. This is something that we ran in March last year and we found that businesses who engaged in this really did benefit from it. We managed to attract a lot more people to Leederville and noticed that they stayed longer and enjoyed being able to spill out onto the streets. This year we have 17 local businesses participating and we are also running it to coincide with some exciting events in Leederville namely Leedypalooza Unfair Day which is a branch of the Fringe Festival specific to Leederville, Leedypalooza Dancin’ in the Street, the AFL pre-season game Eagles v Port Adelaide and the long weekend. I would also like to give an update on Hyde Street Reserve. This is a capital works project which is proceeding at the moment. It is part of our Council’s priority to create more inviting green and open spaces. This is our first road to park demonstration project where we are literally digging up a road that is not particularly well utilised next to Hyde Street Reserve and basically doubling the size of the park. We have been doing this with the support of the immediate neighbours to the park. We are, for the first time celebrating Chinese New Year on William Street on Friday 16 February. We are going to be welcoming in the Year of the Dog. We will be spending some time on William Street, greeting people, talking to traders and giving out some free fortune cookies so come on down to William Street and experience the New Year celebrations. Finally, I would like to acknowledge that this is our Director Corporate Service’s last meeting in the chair as Director and while John doesn’t like to have the spotlight shone on him I thought I would take the opportunity to say a few words. John has been in the Director role for 3 years. John started with us in early 2015 and at the time he walked into a situation where our financial position needed a very good and stern hard look at. I think that John has achieved many things in his short time in the role but the most significant of those has been to bring our finances into the black, with a positive, healthy and sustainable future ahead of us. He has had a very strong focus on asset sustainability and long term planning and has also helped us in getting our leases in order. John, the rigour and ‘tough love’ approach that you brought to the role has been very valuable. You have been a very strong and able advisor and I would also like to say that you have sometimes affectionately been referred to as ‘General Paton’ for your tough and firm approach. You are not able to slip out unnoticed! We did have to stop and pause and say thank you for a job that has been extremely well done. We will miss you in the role! Thank you. 8.1 Presiding Member Mayor Emma Cole declared an impartiality interest in Item 9.7 - Nos. 77-79 (Lots: 3 and 4; D/P: 7680) Anzac Road, Mount Hawthorn – Six Grouped Dwellings. The extent of the interest in this matter is that Mayor Cole is an owner/occupier located on the right of way on which the proposed grouped dwelling will be located. Mayor Cole’s property is not a neighbouring or adjoining property. 8.2 Cr Topelberg declared a proximity interest in Item 9.3 - No. 22/60 (Lot: 22; S/P 16992) Smith Street, Highgate - Change of Use from Grouped Dwelling to Unlisted Use (Short Term Dwelling). The extent of the interest in this matter is that Cr Topelberg’s parents own and reside in a property opposite the site of the application at 34 Broome Street, Highgate. Cr Topelberg did not seek approval to participate in the debate or to remain in the Council Chamber or vote on the matter. At 6.21pm Cr Harley arrived at the meeting. Items 9.1, 9.2, 9.3 and 11.6. That Council NOTES the Investment Report for the month ended 31 December 2017 as detailed in Attachment 1. That Council REFUSES the Water Corporation’s request for a drainage easement to be registered over the Certificate of Title for Lots Y232 and Y233, comprising a portion of Robertson Park Tennis Club, to provide the Water Corporation with the power to access its drainage infrastructure beneath the land and to restrict any development over the drainage infrastructure on the basis that the Water Corporation currently has the power to access its drainage infrastructure and the City cannot interfere with the drainage infrastructure pursuant to the Water Services Act 2012. Thus granting an easement would unnecessarily increase the Water Corporation’s current powers. That Council RECEIVES the Financial Statements for the month ended 31 December 2017 as shown in Attachment 1. 2. Subject to final satisfactory negotiations being carried out by the Chief Executive Officer, AUTHORISES the Mayor and Director Corporate Services to affix the common seal and execute the licence conditions above. 2. NOTES and ENDORSES the response provided by Administration to the General Business motion carried at the Annual General Meeting of Electors held on Tuesday 30 January 2017 for the reasons outlined in the report. At 6.26pm Cr Loden arrived at the meeting. 1.2. Condition 4.2 is deleted. 10.3 A review of the Management Plan shall be submitted to the City for approval within six months and again within 12 months of the issue of this approval. Any changes identified as part of these reviews, or required by the City, shall be incorporated into an updated Management Plan to the satisfaction of the City and submitted to the City within 14 days of the City’s approval of the review. The development shall thereafter operate in accordance with the updated Management Plan. 3.4. that following Gazettal, in accordance with the Local Laws Explanatory Memoranda Directions as issued by the Minister on 12 November 2010, a copy of the local law and a duly completed explanatory memorandum signed by the Mayor and Chief Executive Officer will be sent to the Western Australian Parliamentary Joint Standing Committee on Delegated Legislation. The development shall maintain an active and interactive relationship and uninterrupted views between the ‘Office’ and ‘Reception’ areas of the development and Green Street and London Street during the hours of the development’s operation to the satisfaction of the City. Darkened, obscured, mirror or tinted glass or the like is prohibited. Curtains, blinds and other internal or external treatments that obscure the view of the internal area from Green Street and London Street are not permitted to be used during the hours of the developments operation. That Condition 1.3 be deleted and the remaining Conditions be renumbered. Cr Joshua Topelberg declared a proximity interest in Item 9.3 and left the meeting at 7.12pm prior to consideration of the Item. At 7:24 pm, Cr Joshua Topelberg returned to the meeting. 4. ADVISES all respondents of Council’s decision. 3.4 that following Gazettal, in accordance with the Local Laws Explanatory Memoranda Directions as issued by the Minister on 12 November 2010, a copy of the local law and a duly completed explanatory memorandum signed by the Mayor and Chief Executive Officer will be sent to the Western Australian Parliamentary Joint Standing Committee on Delegated Legislation. That the motion be deferred for further consideration. Reason: The deferral motion was raised to enable further review of the operation of clause 7.1 of the Standing Orders (procedural motion to defer an item), and in particular the appropriateness of the current entitlement for any member to move such a motion after they have already spoken on the substantive item. 1.2 add Sarah Marchant, Christopher McClelland and Bethamy Linton as joint lessees. 2. Subject to final satisfactory negotiations being carried out by the Chief Executive Officer, AUTHORISES the Mayor and Director Corporate Services to affix the common seal and execute the variation of lease in 1 above. 4. AUTHORISES the Mayor and Director Corporate Services to affix the common seal and execute any Deed of Variation of lease approved under the authorisation granted in 1 above. 5. 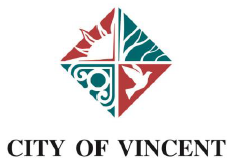 AMENDS the Safer Vincent Crime Prevention Partnership Terms of Reference so that membership of the group includes two Council Members. That Council RECEIVES the Information Bulletin dated February 2018. 3. Relative to 2. above, REQUESTS the Chief Executive Officer to write to the MRC seeking confirmation of the Council Members (if any) that will be attending the interstate Energy from Waste Conference. At 7:58 pm, Cr Jimmy Murphy left the meeting. At 8:01 pm, Cr Jimmy Murphy returned to the meeting. Cr Gontaszewski requested the amendment be considered and voted on in two parts, namely parts 1 and 2 together and part 3 separately. The Presiding Member, Mayor Emma Cole agreed with the request to consider and vote on the amendment in two parts. Cr Castle, via the Presiding Member, Mayor Emma Cole, sought feedback from the mover and seconder of the Amendment to change the word “REAFFIRMS” to “SUPPORTS”. Cr Loden and Cr Gontaszewski agreed, as the mover and seconder (respectively) and the Amendment was changed accordingly. 4. Opportunities for the City to engage with other local governments, now and in the future, as part of the Waste Strategy and the City’s ongoing improvement in waste management practices. These Minutes were confirmed by the Council as a true and accurate record the Ordinary Meeting of the Council held on 6 February 2018.